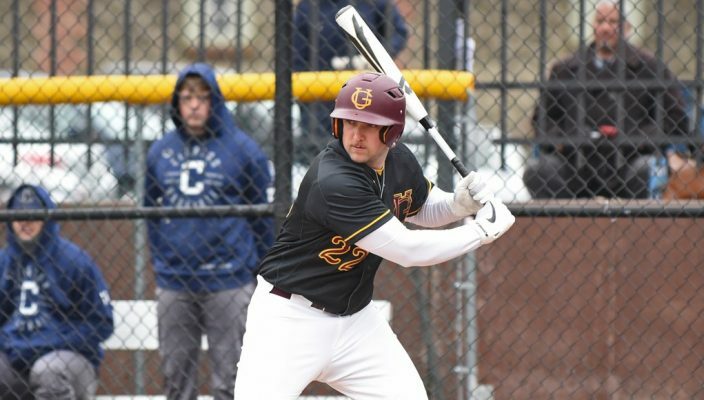 The Gannon University baseball squad squared off against Seton Hill in a four-game series Saturday and Sunday, looking to climb into first place in the Pennsylvania State Athletic Conference’s West Division. The Knights wound up breaking even, splitting a doubleheader Saturday in Greensburg and salvaging a split of Sunday’s doubleheader at McConnell Family Stadium with a dramatic 9-8 extra-inning win in the nightcap. Sunday’s win was the 100th for Gannon coach Greg Coleman, who became the third baseball coach in school history to reach that milestone. On Saturday, Gannon took the first game, 7-4, but lost the second, 3-1. Sunday at home, the Knights fell 5-1 in the opener before winning the second game on Elijah Quiceno’s leadoff home run in the bottom of the 11th inning. The weekend split left Gannon 19-9 overall and 9-3 in the PSAC West, good enough for a share of first place with rival Mercyhurst. The Knights will return to action Friday when Indiana University of Pennsylvania visits McConnell Family Stadium for a 1 p.m. doubleheader. In Saturday’s doubleheader opener against Seton Hill, Deven Judy took the mound looking to protect his 2.65 ERA and he did exactly that. Throwing five scoreless innings out of a total of 7 2/3, all Judy needed was some run support for the Knights to be successful. He would finally get it in the form of a six-run eighth inning that included two-run doubles from Brandon Wetherholt and Quiceno and an RBI single from Ian Hess. The outburst put Gannon up 7-1, and Matthew Yough closed the door on a Seton Hill rally to save the win. Jared Beach’s ninth home run of the year accounted for Gannon’s first run. In game two, the offensive dominance that Gannon showed seemed to fly south by the first pitch. Seton Hill pitcher George Coyle was able to suppress the Knights, as they managed only three hits. Gannon scored on a suicide squeeze from Ian Steighner in the third inning, but that would be the Knights’ only run of the game. Seton Hill tied the score in the fourth and used dual RBI singles to go up 3-1 in the sixth. Sunday’s first game featured another fine pitching performance from the Griffins, as Marshall McGraw limited the Knights to just four hits in a complete-game win. Hess had two of the four hits for Gannon, whose only run came in the fourth inning on Ryan Kalbfus’ RBI double. In the final game of the doubleheader, the Gannon bats finally came back to life in a close one that would come down to the final pitch. Home runs from Quiceno and Wetherholt put Gannon ahead early, and with a five-run fourth inning outburst, the Knights looked to be on the easy road to victory, leading 8-3. However Seton Hill bounced back to score twice in the fifth and three times in the sixth inning to tie the game at 8-8. After a scoreless seventh, the game headed into extra innings for the first time this season. The score would remain tied for three extra frames before Quiceno launched a walk-off homer to lead off the bottom of the 11th inning and end the weekend series at two wins apiece. The Knights pounded out 14 hits, including two each by Steighner, Quiceno, Hess and Wetherholt. Beach and Quiceno each drove in three runs.